The Kenneth Rattray Conference Room (formerly Conference Room 1), the largest, is equipped with an electronic voting system and is capable of accommodating up to 1200 persons. An observers’ gallery and public and press galleries are located on the first floor. The speaker’s rostrum is elevated and a portable circular stage can be installed for artistic performances. Office facilities are located behind the Conference Room and a documents distribution booth located within the Conference Room. Conference Room 2,is similar to Conference Room 1, with press gallery, offices for secretariat as well as documents’ distribution counter. Both Conference Rooms 1 and 2 open on to the 4400 sq. ft. Harbour Lounge with a magnificent view of Kingston Harbour. Conference Room 3 is a fine reflection of the use of local material in a decorative and functional manner. The bamboo which comprises the ceiling add a warm artistic atmosphere while enhancing the acoustics of the room. Throughout the Centre architectural details made use of indigenous art and craft such as the bamboo ceiling. Conference Rooms 4 & 5 These rooms may be divided from each other by a movable acoustic wall. When merged, these rooms can accomdate just under 400 persons. The barrel vault roof of the preexisting warehouse can be seen clearly. The panels in the ceiling are devices for dealing with acoustics. The white curved panels break up the tendency of the curved roof to focus sound and absorb low frequency sound as well. The hand-woven panels which are made by Things Jamaican from local bull rushes are screens for fiberglass insulations which absorb the high frequency sound. The rooms are divided in half and both sides face each other in a parliamentary style seating.. The Caucus Rooms are ideal for small meetings or training sessions. The room is beautifully designed with mohagony grills over air conditioning ducts, wicker baskets in the elevated ceiling covering acoustic absorption materials and has both natural and artificial lighting. All three Caucus Rooms offer the flexibility to arrange the furnishings in the way most suitable to your event. They each accommodate 40 persons with desks and 70 persons theatre style. The Harbour Lounge offers an unparalled view of the Palisadoes peninsula and Noman Manley airport. The 220ft. glass wall is made of tempered glass and is designed to withstand winds of up to 120mph. The Harbour Lounge is the perfect place for cocktail parties, small receptions or exhibitions. 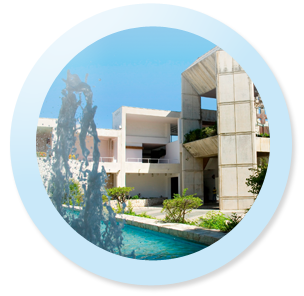 Our Seabreeze Restaurant overlooks the Entry Plaza and Reflecting Pool to the north, and the internal Garden to the south and has a seating capacity of 250 persons. Private dining can be arranged in the Delegates’ Dining Room which is air-conditioned and seats up to 160 persons. The Conference Centre now offers the opportunity to use the services of a caterer of your choice to provide food and beverage for your event. Tables and chairs will be supplied and a cover charge will be applied to all events where food and beverage is provided. The Reception Foyer houses an information desk and documents distribution counter. The Centre provides parking on property for a limited number of its guests. Additional parking is available in the adjoining multi-storey parking facility, which is connected at the first floor level to the Conference Centre by a pedestrian bridge.